Over the years, many have pondered as to the exact point in a career at which footballers must shrug their shoulders and concede their dreams of glory and stardom have slipped them by. For me, it would be if I was to find myself jogging around the lower rungs of the Scottish Football League whilst dressed, in the main, as a biscuit. A fanciful notion, on the face of it, but it was this very fate that met Albion Rovers’ 1983/84 squad when, following a sponsorship deal with local confectioners Tunnocks, the club’s yellow and red livery was tilted to make the players look exactly like their benefactor’s famous Caramel wafer. That commercial tie-in has long since gone, for which the current players might be thankful, but I’m sure the Albion board, given their plans to move away from their dilapidated Cliftonhill stadium, would happily dress their charges as a shimmering mint green Viscount XI if it meant a bit more bunse in the brick fund. Money, though, remains tight. 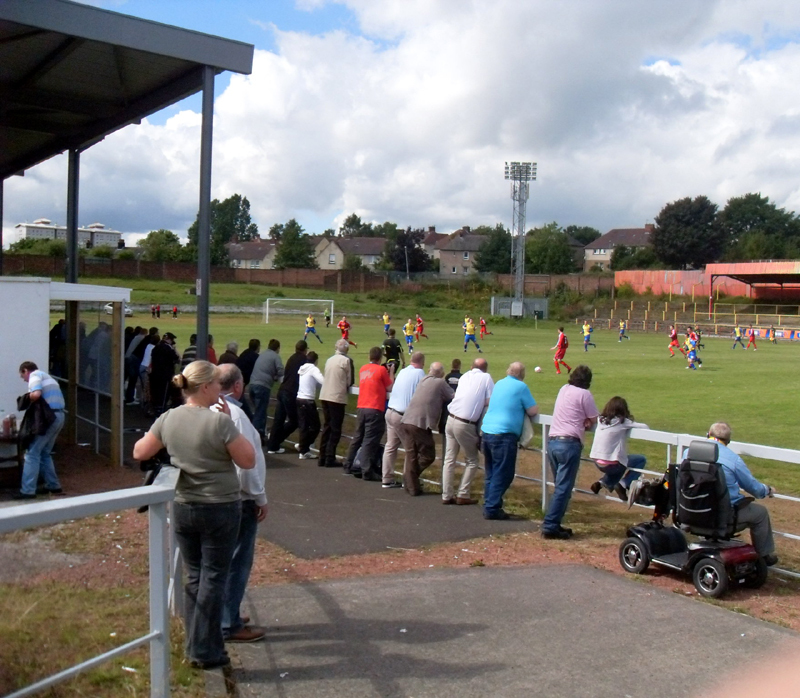 With Rangers and Celtic only ten miles away, and Coatbridge having a significant population coming from a background of large-scale Irish immigration, it is perhaps unsurprising that The Wee Rovers have struggled to attract large crowds and have remained in the fourth tier of Scottish football since that tier was created in 1994. Arriving in Coatbridge from the bustle of Edinburgh on an opening Festival weekend, I was looking to escape the tumult created by a phalanx of honking bag-pipers pumping out their BLAAAAAH in unison up by the castle. However the relative sanctity of the smaller town was soon shattered by a lone piper greeting the arrival of a bride at her wedding ceremony. No sooner had she passed into the church though, the noise came to a mercifully swift halt, whilst the two caged doves hung in white cages from heart shaped stands were removed from the vestibule, and left outside to enjoy the Scottish climate (in this case, a light shower). Not exactly the glamorous career that these doves sign up for, I’d imagine. This aside, Coatbridge seemed on down-time, with the quiet only pricked by the passing of cars, many of which appeared to be joining those already settled collectively adjacent to the town’s bingo warehouse. The lack of bustle could, I guess, lend some succour to “the most dismal [town] in Scotland” tag that Coatbridge was ‘awarded’ by Prospect architecture magazine in 2007. Let us not forget the great things that have come out of the town though: Tannoy public address systems; the iron that armour-plated British ships fighting the Crimean war; and, of course, the 1987 Top 10 hit Labour Of Love by Hue & Cry. 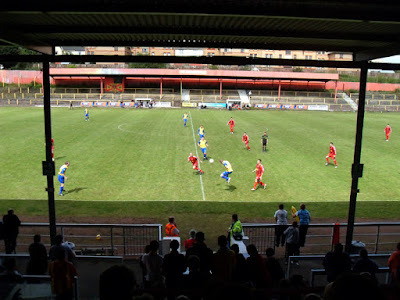 Inside Cliftonhill, the Tannoy system appeared to be working fine, but would have benefited from someone keeping an eye on the playlist, as an Irn Bru advert detailing ‘The Ginger Boot’ competition for Football League players was rotated about eight times in succession. “The rules: score, score and score again, but only league goals count so there’s no point pinging in a hat-trick against Drumnadrochit University” is now a sentence embossed upon my brain like a farmer’s initials on a cows bum-cheek. The ground itself is now as good as one sided with the deep far-side terracing being allowed to collect weeds rather than feet. Behind the goals are merely mounds of grass and nettles, into which one of the home players was able to take a pre-match piss whilst lackadaisically attempting to retrieve a lost practice ball. The opening exchanges of the game, and thus the league season, were rather beige, aside from a 25-yarder from Rovers’ striker Paul McLeod which beat Berwick keeper Ian McCaldon but hit the outside of the post, not with a ping or a thud, but with the sound of a stout gentleman taking a stiff punch to the belly. It was on the half hour that the home side took the lead through McLeod, who capitalised on Alan Benton’s hefty welt being left by both McCaldon and defender Craig O’Reilly to tap home. However, within three minutes Berwick were able to equalise when Ciaran Donnelly’s backward flick went straight to Kevin Gordon on his winning gamble of a run, who then turned and shinned in. 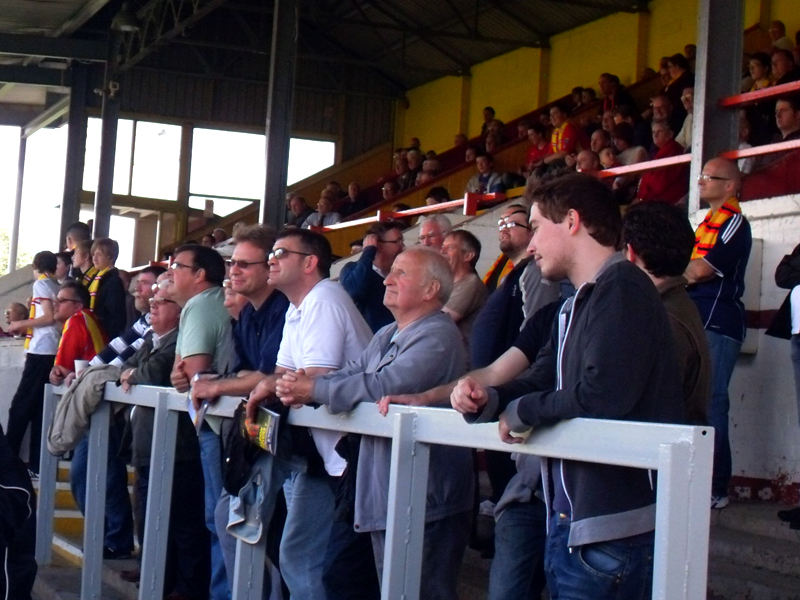 In the second half the home side began to dominate proceedings. However their defenders had to remain alert. 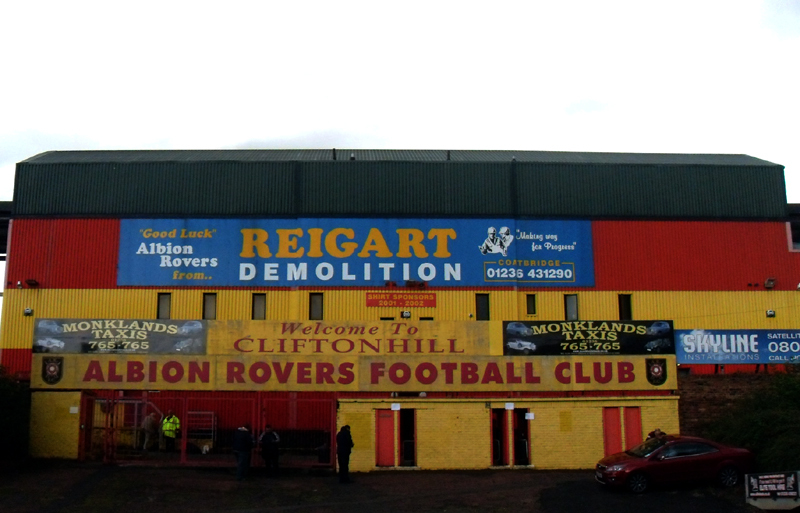 As one massive clearance disappeared over the main stand, one home fan, seemingly confused as to the appropriate Peter Kay catchphrase for the occasion, bellowed “Garlic Bread!” Another bloke in the ‘eccentric section’ of the main stand seats then began to sing “and it’s Albion Rovers…” in a slow, club singer drawl. Yet, for all their hard work, Rovers once more couldn’t hold onto their lead for long. 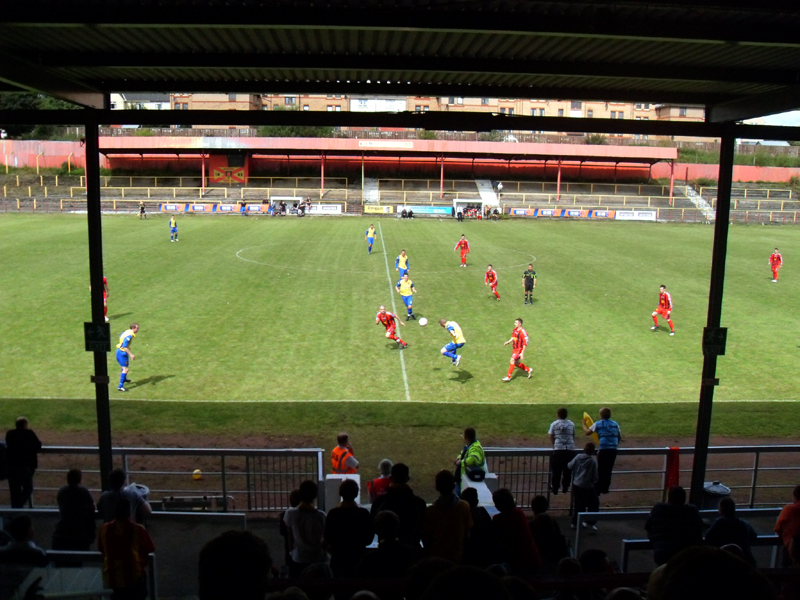 Five minutes from time, after repeated failure on the part of the home side’s defence in their attempts to clear, Paul Currie was able to side-foot home off the inside of the post to earn Berwick a point. Interesting ground to visit. A good obscurity to add to the collection. I start my FA Cup trail at Mossley v. Witton on Sat week. Have a good season.